“Listed is a MXR-185 Drum Machine. It has been completely cleaned/conditioned inside and out both physically and electrically. Everything operates great, all functions, buttons, sliders and jacks have been checked out. Although the sync-to-tape feature has not been verified, I did use TAPE I/O to store, load and verify sequences. The sync to/from tape feature uses mostly the same circuitry, so it should work. The External Trigger Inputs (back Molex connector) work and they can be used to program patterns in addition to the front panel switches. Also, I haven’t tried the External Voice feature. While this unit is super clean and functions like new, I can’t say its appearance is pristine. It has a few dings here & there but nothing unusual for equipment of this vintage. There are no dents, bends or broken pieces. It just has “character”. These minor blemishes are purely cosmetic and have NO effect on any machine operation or performance. It does look much better than these photos depict. 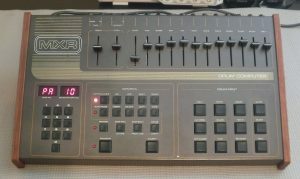 “UP FOR SALE IS THIS VINTAGE 1983 MXR MODEL 185 DRUM COMPUTER. THIS UNIT WAS PURCHASED NEW IN 1983, USED LIGHTLY IN A HOME STUDIO FOR SEVERAL YEARS AND THEN PACKED AWAY FOR THE LAST 19 YEARS. THE BAD NEWS: IT IS NOT 100% FUNCTIONAL. I WILL LIST THE ISSUES BELOW WHICH I HAVE DETECTED. THE GOOD NEWS: FIRSTLY IT IS IN EXCELLENT COSMETIC CONDITION. SECONDLY I HAVE A SET OF ROTO TOMS SOUNDS THAT WERE PURCHASED SEPARATELY FROM MXR AND CAN BE INSERTED INTO THE UNIT TO ACCESS THOSE SOUNDS. I AM INCLUDING THESE (SEE PHOTO) IN THE DEAL AT NO ADDITIONAL COST. I ALSO AM INCLUDING THE ORIGINAL OWNER’S MANUAL. “Zum Verkauf steht ein Drumcomputer der amerikanischen Firma MXR Typ 185 . Die MXR ist im guten Zustand (einige wenige Gebrauchsspuren sind natürlich vorhanden ) und natürlich voll funktionsfähig . Bitte beachten Sie auch das extra grosse Bild .” Auction ended. Click here to browse on eBay. “First off, this unit is really clean. This would be perfect for a museum or for a Rompler Mod project. The sounds are thick and chunky like a Linn and just dripping with character. The unit does NOT have MIDI though there are MIDI to PPQ converters out there to make it run on MIDI. The sequencer section has a couple of limitations like: You can’t change programs while the sequencer is running. You have to press stop, change patterns and then press start again. The unit does not like corrupt patterns. I have confirmed that the CR2032 memory battery in this unit is dead so if the unit sits long enough with no power, the memory starts to fault and then you will have to program the pattern again. All this unit really needs though is someone to take it under their wing and give it a purposeful life again. It’s very cool, very rare and very clean. It also comes with a good copy of the manual. Enjoy.” Auction ended. Click here to browse on eBay. Linn Drum. Some minor external scrappiness, else in great shape and good working order. Rare thus.” Auction ended. Click here to browse on eBay. – It’s a real box – not a plug in! At one point I thought I would collect drum machines from the 80’s, but I never got too far past this one (wife, kids, blah, blah, blah). This has been on the shelf for many years, and it’s time to find it a new home. ” Auction ended. Click here to browse on eBay. “The owner’s manual is what brings this drum computer to life. It will give you a complete understanding of all functions of this powerful machine. In an easy to understand format, you will have no problem getting up and running in no time. * Cosmetically it looks very good, in my opinion I would give it an (7 to 8) out of 10. There are scratches on the bottom plate of the instrument, but as you can see by the pictures the top and sides look almost new. * Everything works fine with no problem. The only thing I couldn’t test was the external trigger inputs, as that I did not have the cable, and I don’t know if any exists. ” Auction ended. Click here to browse on eBay. “The 185 is a cool EProm based drum machine that sounds a little like a Linn or a Drum Tracks. This MXR is in fair cosmetic condition–missing a jack and some sliders. It powers up but not all the sounds work–though I am not sure how to program it. It has all its Eproms and chips. It would make a good project or parts unit.” Auction ended. Click here to browse on eBay. “Verkauft wird eine MXR Model 185 Drummachine. Baujahr 1986. Ähnlich wie die Linndrum oder Oberheim DX und DMX oder die Simmons SDS Serie benutzt die MXR 185 Eproms zum Speichern ihrer zwölf 8Bit-Sounds, was einen unverwechselbaren 80s-Drumsound generiert. Durch Wechseln der Eproms können bei Bedarf neue Sounds eingesetzt werden. Das hier angebotene Gerät ist in technisch gutem zustand. Der “Crash”-Sound ist allerdings lediert. Fand ich nie schlimm, da er so n bisschen IDM-mäßig (Notwist/Console-Geknister) klingt, was eigentlich noch besser ist. Die anderen Sounds sind richtig gut und kommen druckvoll und können in alten Beastie Boys oder RunDMC Platten nachgehört werden. Optisch ist die Kiste allerdings stark mitgenommen und ein bisschen angestaubt. Es geht aber alles. Einige Tasten müssen mehrmals gedrückt werden, bis sie reagieren. Bitte unbedingt die Fotos angucken und bei Unklarheiten Fragen stellen! 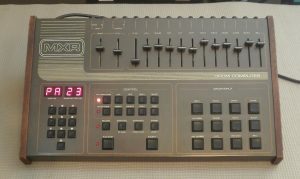 MXR Model185 oldschool drummachine from 1986. Works fine technicaly! The “crash”-sound is a little ucked up. I think, that makes it better and more unique than before, cause now it sounds good for use in IDM productions… but it could also be replaced, cause the sounds are stored on eproms. Opticaly this unit is really messed up. Please see the photos! But it’s working. Some buttons gotta be pressed twice before they react. That are problems, that can probably be fixed by cleaning the contacts from the inside. Please ask, if you have questions!” Auction ended. Click here to browse on eBay.